Otsu-e of an ogre at Miidera temple, Otsu. 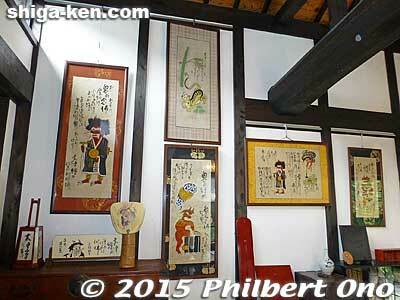 Anyone who visits Otsu will sooner or later see an Otsu-e painting (大津絵). It can be a picture of an ogre (oni), wisteria maiden (Fuji-musume), Buddhist figure, or other surreal or whimsical human, god, or animal. Otsu-e paintings originated as a folk art around 1624-44 and were made and sold by roadside stands in Oiwake near Otsu-juku, the last post town on the Tokaido and Nakasendo Roads before people arrived in Kyoto from Tokyo (Edo). 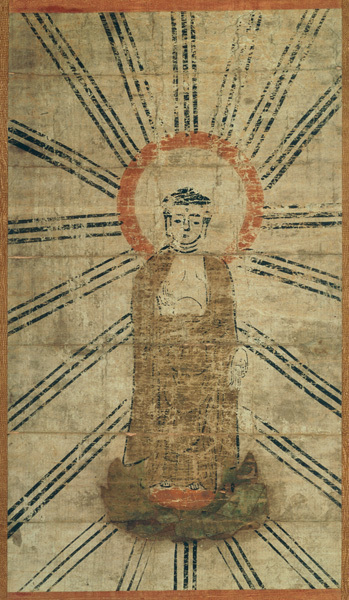 The earliest Otsu-e pictures during 1624-44 depicted mainly Buddhist images. People worshipped these images as an affordable alternative for expensive Buddha statues. Otsu-e paintings were unsigned by anonymous artists and initially served practical and religious functions. They did not start out as paintings for artistic appreciation. Otsu-e was cheap ephemera (as much as a bowl of noodles), not meant to last very long. There are a few theories as to how Otsu-e came about. One theory says that an artist named Matabei started painting Otsu-e. A more plausible theory is that Buddhist painters who lost their jobs in Kyoto due to a realignment of Buddhist sects moved to Oiwake and started painting Otsu-e Buddhist images to eke out a living. By the early 18th century, Otsu-e became popular as cheap, local souvenirs and were no longer just for religious purposes. The paintings expanded to include ogre (oni), wisteria maidens, courtesans, gods (of Good Fortune), samurai warriors, falconers, birds, animals like monkeys, sumo wrestlers, and whatever the customer wanted. Otsu-e were created on demand as the traveling customer waited. They were not ready-made. It took only several minutes to make Otsu-e. Many Otsu-e were produced as a family business. The husband might create the basic outline in black, the wife colorized it, and their child added more details. 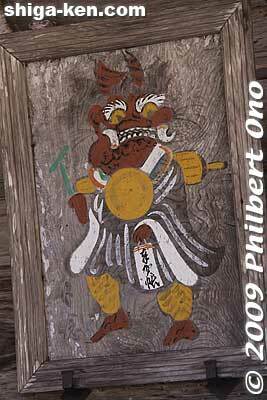 They usually used woodblocks for the basic image, then painted it. The paintings were kept simple to make it easier and faster to make. Alas, Otsu-e has never received as much artistic acclaim in the art world as with works by individual artists (i.e. 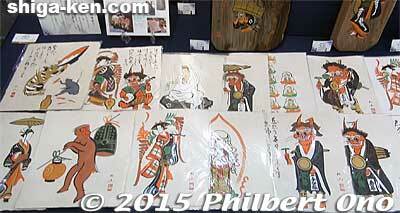 ukiyoe woodblock prints). From the mid-18th century, most Otsu-e paintings depicted satirical scenes reflecting the contemporary times and moralistic or poetic paintings with writings. Proverbs like “don’t drink too much” still applies today. The most popular were still the ogre (oni) and wisteria maiden. The oni (ogre or goblin) is shown wearing Buddhist priest robes, an umbrella on his back, a gong around his neck, and a mallet in his right hand. His left hand holds a list of temple donors (奉加帳). One of his two horns is also always bent. The oni is walking around soliciting donations. 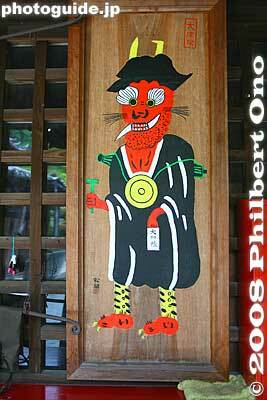 It expresses the notion that a priest without truth has the heart of an oni (devil or evil thing). It reminds priests and people to be honest. By the late 19th century when trains became the main mode of transportation, roadside Otsu-e artists went out of business. They became extinct, but remnants of their existence have remained. Authentic Otsu-e are highly collectible and only some examples from the 17th-18th centuries remain today. Tanaka Kokei showing two Otsu-e folding screens fitted together. Other works in Kokei-an gallery. In the modern age, Otsu-e has been resurrected by a number of practitioners. I recently met two of the most established Otsu-e artists. Both have created their own approaches and versions of Otsu-e, although purists might not accept either of them as a traditional Otsu-e artist who sold paintings anonymously for cheap. One of them is Otsu-e artist Tanaka Kokei (田中胡径) based in western Otsu. She gave me an exclusive interview at her gallery named Otsu-e no Yakata Kokei-an (大津絵の館 胡径庵) in July 2014. She was kind enough to bring out a whole bunch of heavy folding screens to show me, in addition to what was displayed in her gallery. Her work is beautiful, but very high end, apparently targeting well-heeled collectors. They are not ephemera and do not come cheap. Especially when they are presented on exquisite folding screens, scrolls, or frames which are works of art in themselves. She even showed one folding screen with a washi paper backing made by the late washi artist Abe Eishiro (安部栄四郎) who was a Living National Treasure. So the picture mounting adds to the cost. Definitely not for the masses nor for the ordinary passing tourist on a budget. But her works are outstanding. She works with her daughter Yumi in an interesting arrangement. Kokei directs how the picture is drawn or composed, but it’s Yumi who actually paints the picture and does the calligraphy. Like an art director and art technician working together. Although their Otsu-e are not signed, they can be easily identified by the innovative and unique mounting on folding screens, scrolls, and frames. They are meticulous in all aspects of making and presenting Otsu-e. They diligently reproduce authentic Otsu-e colors by using authentic pigments, methods, paper (handmade washi only), and other top-quality materials. Their pictures are designed to last and be appreciated for a long time. Even the folding screens for mounting the Otsu-e are intricately made by highly skilled artisans. Sometimes she even argues with the folding screen artisans over the design, etc. Rather than making Otsu-e ephemera that people might just stuff in a closet or attic, Kokei wants her work to be treasured from generation to generation as a family heirloom. Make it important enough for the owner to give it the attention it deserves. And to give it a place in the home. She’s most satisfied when her Otsu-e ends up in a home of people who can appreciate it. She believes that unless Otsu-e are presented in a more permanent and impressive way, its artistic heritage might be lost. Longevity and preservation seem to be her keywords. A far cry from 17th-century artists whose paintings were simply rolled up for carrying and used for a short time. Kokei sensei has taken Otsu-e to a much higher level. 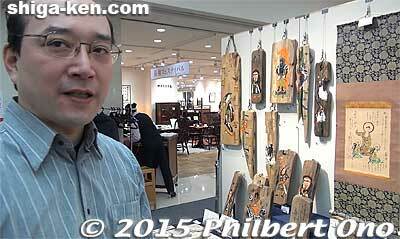 I also asked if Kokei sensei accepts custom orders, painting according to the customer’s specifications. Although the customer may have some requests, Kokei usually ends up convincing the customer that her proposal would work better based on where the Otsu-e would be placed in the home. Kokei is originally from Kyoto. Her family ran a picture frame/mounting business. Her father also repaired art works. Sometimes he would restore old Otsu-e. Visiting customers bringing Otsu-e would talk to her father while Kokei, still in jr. high school, would bring tea for the customer. That’s when she first saw Otsu-e. Her first impression of Otsu-e was that it was grungy, dirty, and manga-like. After getting married and moving to Otsu, she again saw Otsu-e and was appalled by how different or untraditional modern Otsu-e was compared to traditional Otsu-e. She didn’t think the modern Otsu-e was doing the traditional art justice. Around 1984 while in her 30s, she started seriously studying Otsu-e. She wanted to know what the authentic Otsu-e was, the definitive form of Otsu-e. She studied under a number of Otsu-e teachers and eventually decided to create or resurrect Otsu-e herself. Kokei asked her daughter Yumi to paint Otsu-e while Kokei would handle the mounting. Yumi, who was a certified art curator, said yes and quit her job at an art museum and studied how to paint Otsu-e. Evidently, she’s very good at it after about 10 years. She even does the haphazard-looking calligraphy. When they first started out, they were prepared for a frugal life on a frugal income. Similar to when early Otsu-e painters started in the 17th century. Kokei was also brought up by a frugal family which she says was a blessing. Her family was dedicated to preserving traditional culture and Kokei and daughter Yumi are continuing this family mission. In 1994, she opened her Otsu-e no Yakata Kokei-an gallery in a quiet residential neighborhood in Shimo-Sakamoto in western Otsu. 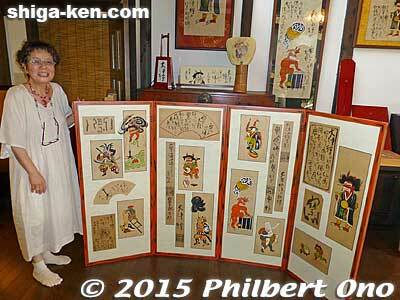 The gallery shows several tens of her pictures mounted on scrolls, in glass frames, on folding screens, etc. As of this writing, she has no website, so she might be obscure to the layman and foreigners. She has exhibited at department stores, but she’s not into mass marketing. You either know about her or you don’t. To visit her gallery (or purchase her paintings), call to make an appointment (English not spoken). The gallery is somewhat hard to find and there is limited parking. Best to call and get directions. The closest station is Anoo Station on the Keihan Line. Map here. *Kokei sensei is holding an exhibition of her Otsu-e at Hiyoshi Taisha Shrine’s Hiyoshi Kaikan hall during Nov. 20–28, 2015 at 9:30 am to 4:00 pm. 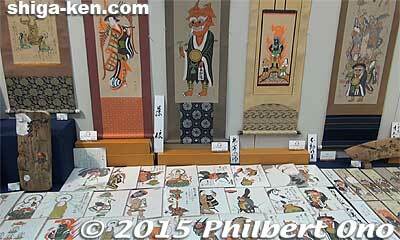 Takahashi Shozan (Shinsuke) at a Shiga crafts fair. Otsu-e by Takahashi Shozan. Notice his signature/seal on the lower right of each work. The other prominent, modern Otsu-e artist is Takahashi Shozan IV (高橋松山). His father Shozan III was also an Otsu-e artist under whom he apprenticed in the 1950s. His son Shinsuke is also an Otsu-e artist. Unlike Kokei, Shozan is very much into mass marketing and I’ve come across his Otsu-e pictures a number of times at crafts fairs and souvenir shops in Shiga. He also has a website (partially in English) and an online shop. His Otsu-e are available on high-end scrolls and driftwood as well as on cheaper media such as handkerchiefs, postcards, and stationary. They are nice and colorful and look traditional. He’s got all the popular Otsu-e designs such as ogres, wisteria maidens, courtesans, etc. They make for a nice decoration or gift. If you cannot afford his pricey Otsu-e paintings, you can always buy something cheap like a postcard. All his works are signed by him. They are not anonymous like the original Otsu-e were. This is understandable in this day and age. I always believe that credit should be given or claimed where it’s due. But Otsu-e purists might say “no” and it might be disheartening, but any kind of tradition is always changing in some way. Shozan has a shop in central Otsu. He also teaches Otsu-e classes. Phone: 077-524-5656. 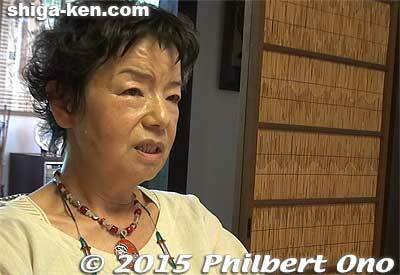 Also see my short video interview of Shozan. 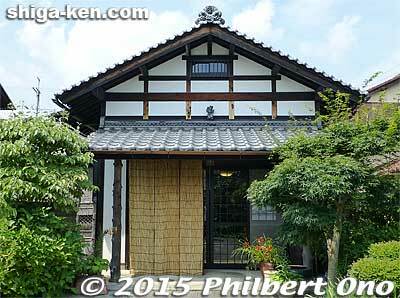 It’s interesting to see how Otsu-e has evolved, reflecting the times, even today. 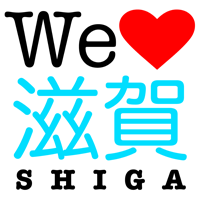 In this modern age, we still have a good choice when it comes to Otsu-e, one of Shiga’s unique art forms. *You can see original, centuries-old Otsu-e at the Japan Folk Crafts Museum (Nihon Mingeikan) in Tokyo which has a large collection of Otsu-e that was donated by an avid collector. They also published a comprehensive and well-illustrated bilingual book (Japanese and English, ISBN 978-4885919251) about Otsu-e. You might find the book in a public library in Shiga. The Japan Times also published an article about the museum’s Otsu-e exhibition in 2005. The Otsu City Museum of History also has a few Otsu-e.